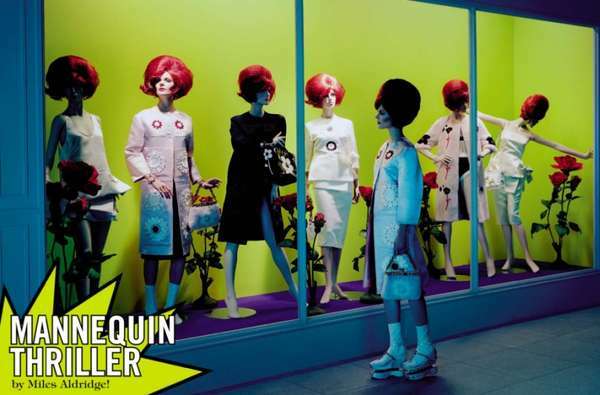 The Vogue Italia 'Mannequin Thriller' editorial tells the story of a woman who wanted to look like a mannequin. Although the photoshoot takes a pop art approach that dramatizes this desire, it wouldn't be surprising if everyday women found themselves envying the perfect form of mannequin models. The look in model Kinga Rajzak's eyes holds new meaning with this in mind. Shot by photographer Miles Aldridge, the Vogue Italia 'Mannequin Thriller' editorial is at once dark and vibrant, eerie and elegant.